Simple tool that list all DLL referenced by an executable or a library file. The "bovine" is dued because of the not so refined analysis done on the file to be examined. 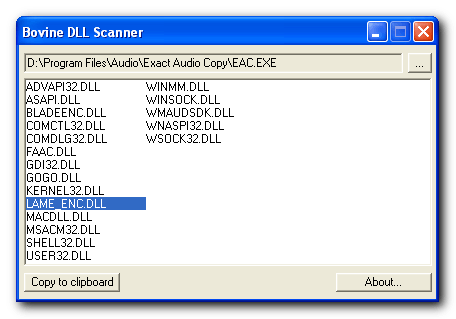 BDLLScan simply search for all the strings that end with ".DLL"\00. A bit rough but generally quite effective, and very fast. * Improved filtering for non DLL strings. + Copy report to clipboard.